Diana's Room - This is Diana's space to share her stories, artwork, and whatever else strikes her fancy. Steven's Crib - Steven is growing and changing fast! Stop by here often to see his latest news and photos. On Saturday April 12, John, Trish and Steven attended the University of Maryland Shuttle-UM 30th anniversary reunion. John drove a campus shuttle bus in 1988 and 1989, and has fond memories of life as a busdriver. Visit the Shuttle-UM website for more information on the shuttle system. 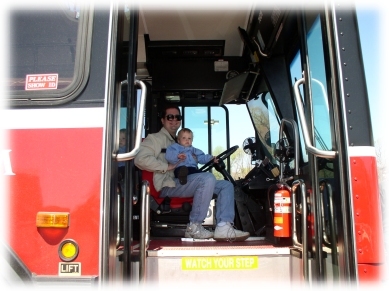 Steven was fascinated by the big red bus, and wanted to drive it! Unfortunately, he wasn't as enthusiastic about posing for a picture with Daddy. ©2004 John and Patricia Day; All Rights Reserved.